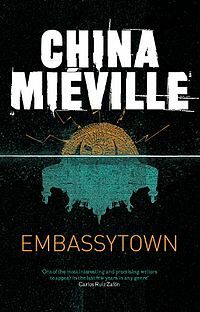 I found Embassytown by China Mieville easy to put down - it was just that I couldn't help but pick it up again. The writing was mesmerising. The more I read the more I was drawn into this human-alien culture, so unlike any other science fiction I've ever read. Despite the eloquence and masterful writing, it is not an easy read. Mieville takes the Scifi adage 'resist the urge to explain' to an extreme, so that at the beginning it is very hard to work out what the hell is going on. And when it gets to inter-planetary travel, he avoids every single available warp or faster than light travel cliche and trope and invents the 'immer': fantastic, poetic, and almost incomprehensible - but that is the point, and he carries it off brilliantly. The titles of the chapters still make no sense to me, even after I have inished the book, but why should they? The reader is an observer, an interloper (a 'floaker', in Mieville's terms) of a human culture so distant from our own that it seems, and it is, alien, except that human characteristics, especially our weaknesses and fears, prey large on the plot. The protagonist, Avice, is herself very flawed, making it easy for the reader to empathize with the terrible decisions that have to be made in the second half of the book. The spiders, the Arakei, are never too clearly described, with their fanwings and coral eyes, but they are from the beginning an enigma, as is the arrival of EzRa, which is where the book really takes off from a plot perspective. They do not speak as we do, and in fact the whole book is about language and meaning, and just how difficult it could be to communicate with a truly alien species. The intricacies of how their language works, and the dramatic effect EzRa's arrival has on them, are well-thought-out; this is a deep novel, a masterpiece. Unlike many science fiction books, the ending was excellent and satisfying. I read this one on kindle, and after finishing it, I paused a few minutes and then went straight back to the beginning, where I had originally been captivated and confused in equal measure, and started reading again. I can't remember doing that with another book, except Lord of the Rings, a lifetime ago. Doubtless one of the reasons I persevered with it was its focus on language and communication difficulties, and the fact that the aliens in question were spider-like, as I have all these elements in my Eden Paradox series, but this writer is a master, and it was humbling to read. I don't think it is for everyone, but this is serious, high-end, well-written hard science fiction that heads off on a right angle away from most Scifi, into the immer... If there was a nobel prize for SF writing, this would get my vote. 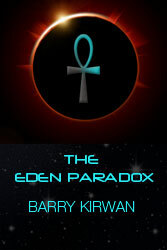 The Eden Paradox is available on Amazon, Barnes & Noble, Waterstones and Ampichellis. The sequel, Eden's Trial, is available on Amazon. The third book, Eden's Revenge, will be out Xmas 2012.